A perfect combination of a mild detergent and a silicone based water emulsion, enriched with lanolin wax. It yields a satin finish and it is solvent free. 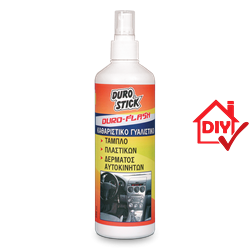 Penetrates leather, rubber and vinyl pores, removing both surface but also absorbed dirt. Delivers antistatic, long lasting protection. It minimizes the effects of solar radiation and humidity. Protects all surfaces it is applied on from fading, discoloration, bursting, and slows down their eventual ageing.